I wish I had posted this recipe for Easy Tomato Jam, six months back when summer was at its peak. 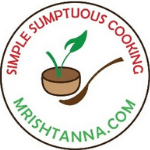 But, it is never too late to share a good thing, so here we go… Tomatoes are a staple ingredient in several Indian and perhaps all other cuisines as well. You will notice that tomatoes play an important role in my recipes. So much that I also have grown tomato plants in my backyard and it has come in very handy at times. If you love tomatoes as much as I do, you will love the idea of enjoying such ripe tomatoes in ways you’d never imagine. Use it on your favorite sandwich or try it with rotis. I’d say it is a very healthy alternative for store-bought ketchup, especially if you are looking to avoid pectin in your diet. 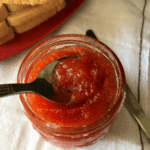 Homemade Tomato Jam is actually quite simple to prepare. There are very few pitfalls you would look for. Most importantly, be sure to adjust how much sugar and lemon juice you add, depending on how ripe your tomatoes are. You should also cook it long enough to evaporate the native water content from the tomatoes. Try this recipe today! I look forward to your comments and perhaps photos too! Wash the tomatoes and boil them just a little to soften the skin. De-skin the tomatoes and blend them well. Place a pan over medium heat and cook the tomato puree. As the puree thickens, add sugar and cardamom powder. Continue stirring for about an hour and add a teaspoon of lemon juice and continue to stir, until most of the water has evaporated. Switch off the heat and store it in an air-tight canister. 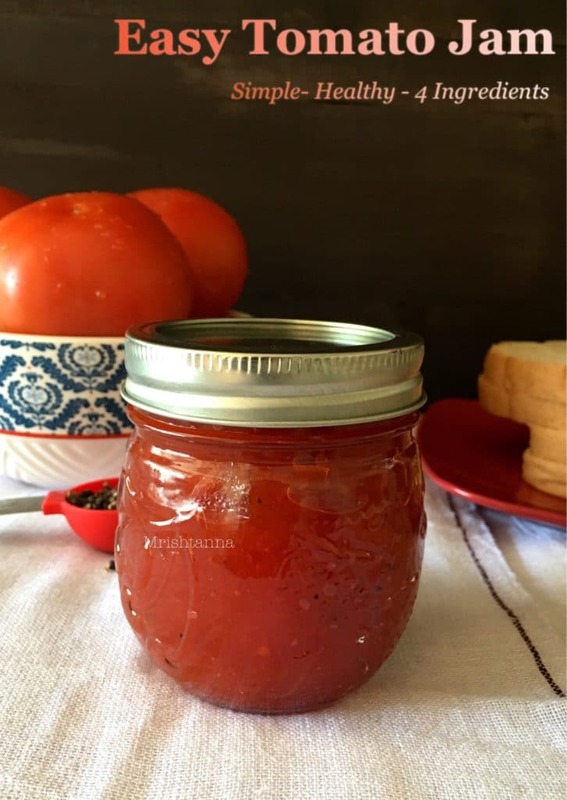 Homemade Tomato Jam is ready and can be enjoyed for months! 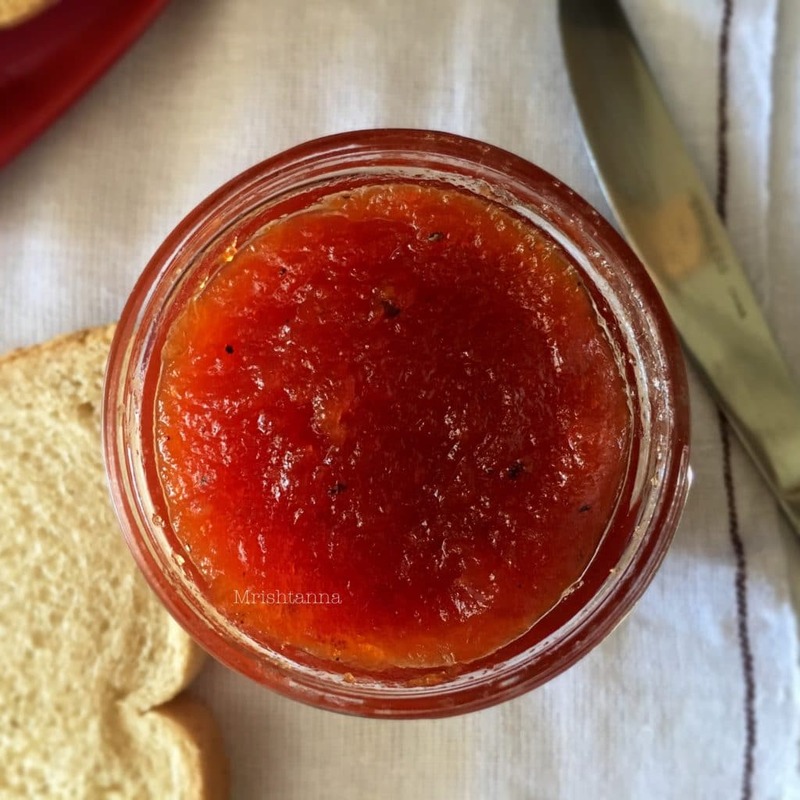 Easy Homemade Tomato jam made with only 4 ingredients. An easy and delicious spread for toast. A savory jam sounds interesting! I’ve never had tomato jam! It looks so simply and easy. Great way to use up those tomatoes! I love the idea of using homemade tomato jam instead of ketchup. Thanks for sharing! Yes it is Linda 🙂 Thank you ! I’ve never tried a tomato jam but this looks good. Will try soon.